Searching through the junkyards of Iron City, cyberphysician Dr. Dyson Ido (Christoph Waltz) discovers the remains of an advanced female cyborg powered by a human brain. Reading faint scans of life, the esteemed doctor is able to reanimate her components, attaching them to a state-of-the-art cybernetic skeleton he originally designed for someone sadly no longer amongst the living. 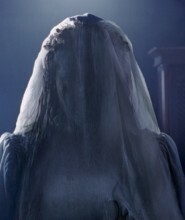 Once awakened, this young woman, age unknown, has no memory of who she is or where she was from. 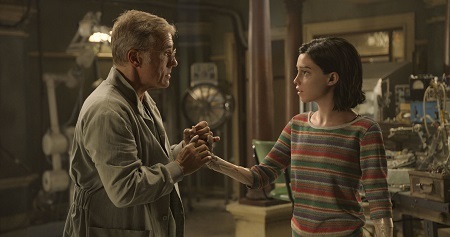 Dr. Ito christens her “Alita” (Rose Salazar), proceeding to treat her as the teenage daughter he wished he could have had. Alita is amazed by the world around her. Its colors. Its textures. Its smells. Its ugliness. Its beauty. All of it is revelatory, and even though Dr. Ido is wary of letting his new charge stumble around too freely, he also understands he has to let this youngster discover her place in Iron City no matter what it might be. Problem is, Alita is no normal cyborg. Hidden within her are the skills and talents of a warrior, ones powered by technological mechanisms so advanced powerful forces will stop at nothing to get their hands on them. But Alita’s drive to protect life, all life, no matter how small or seemingly insignificant, is strong, and while she’s determined to learn about who she is and where she comes from, she’s equally driven to make sure those who are doing ill to others are held accountable for their crimes. 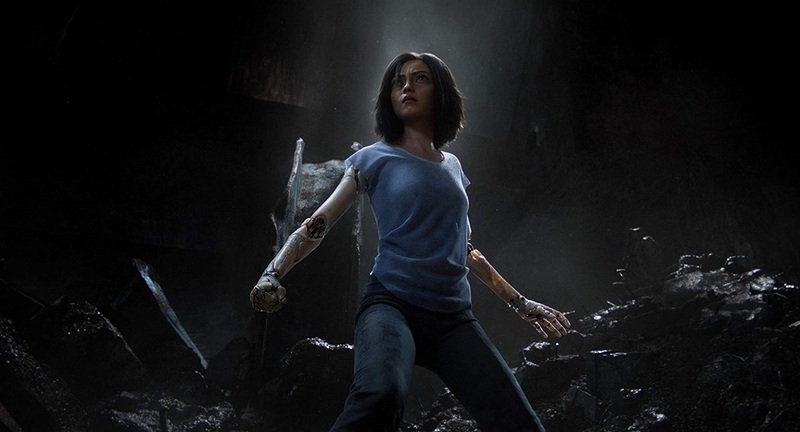 There’s a lot going on in director Robert Rodriguez’s (Desperado, Sin City) and co-screenwriter/producer James Cameron’s (Titanic, The Terminator) visually dynamic Alita: Battle Angel, an ambitious adaptation of the wildly influential Japanese Manga series conceived and written by author Yukito Kishiro. This dystopian 26th-century landscape is a wild, anything-goes hodgepodge of a variety of science fiction concepts and tropes going back to the invention of the genre, all of it brought to life with imaginative precision by the filmmakers. This is a violently dangerous world overflowing in eccentric wonders, and while not all of it is as fresh or as original as I’m certain Rodriguez and Cameron hope it is, that does not make what transpires any less magnetically thrilling. The reason for this is entirely due to the titular character. Alita is a curious, wide-eyed youngster whose heart overflows in compassion and hope. She is an intelligent teen who wants to think the best about everyone she encounters while at the same time firmly believing that those who do wrong need to face justice. She is excited about learning everything that life has to offer and is energized with every new emotional experience, allowing herself to become infatuated with a fresh-faced young man, Hugo (Keean Johnson), more because she can than because doing so will end up doing her any sort of practical good. I love this about the movie. I adored that Alita was so full of hope, so overflowing in optimism. I liked that she goes out of her way to find pleasure in life and that she isn’t afraid to showcase her abilities even as she is learning what they might be. There is profound joy to be found in the moments she plays this century’s most popular sporting event, a bizarre amalgam of the game from Rollerball, demolition derby and NASCAR called “Motor Ball” that’s as silly as it is rambunctious. Alita, even though she’s a cyborg, is still blissfully human, and it’s rare to watch such an expensive, action-filled piece of science fiction viewed through the eyes of a protagonist who is entirely decent and unquestionably humane. Outside of all of that optimism, however, is a rather traditional story of the powerful elite doing what they can to subjugate the remainder of humanity no matter what they cost using all means necessary that are at their disposal. In this case that’s the mysterious Nova, a powerful despot who resides high above Iron City in Zalem, the last of the floating metropolis and a place only the world’s elite can call home. He wants Alita’s heart and contracts a variety of thugs, reprobates and enforcers to get it for him, a list that includes Motor Ball impresatio and clandestine crime lord Vector (Mahershala Ali) and Dr. Ido’s disgruntled ex-wife and fellow cybernetic genius Chiren (Jennifer Connelly). It’s this facet of the story that can grow tedious. Cameron and co-writer Laeta Kalogridis’ (Shutter Island) script is fairly rudimentary as it pertains to all the baddies out there wanting to do Alita harm, and while the most powerful of them, a gigantic fellow cyborg named Grewishka (Jackie Earle Haley) who gets upgraded several times in order to become even close to as powerful as his diminutive prey, is admittedly pretty scary, he isn’t so much so that he masks the overfamiliarity of the plight the heroine and her friends find themselves forced to deal with. As lethal as things get there’s also not much in the way of anything approaching a substantive surprise save one primary plot twist. There’s just not a lot of tension, which considering this is an incredibly expensive, expertly produced high-octane science fiction action film is something of a minor problem. Emphasis on “minor.” I got a kick out of Alita: Battle Angel. Rodriguez, a slapdash barnburner of a filmmaker more content to make low rent throwaways like Machete, Planet Terror or a Spy Kids sequel more than he is to work on anything substantive shows an ability to take his time and to trust his audience in ways he frankly never has before. There is a visceral energy to the action sequences that is superb, ace cinematographer Bill Pope’s (The Matrix, The Jungle Book) lush, visually opulent 3-D camerawork cut together masterfully by editors Stephen Rivkin (Avatar) and Ian Silverstein (Predators) in a way that allows there to be kinetic cohesion to these moments that’s extraordinary. This is all coupled with outstanding motion capture effects that bring many of the characters, most notably Alita, to life in ways that fascinate and inspire. The film also features extraordinarily immersive sound design that helped catapult me right into the center of the screen almost as if I were living there alongside the characters, the dust, grime and grit of Iron City so palpably thick there were times it was almost as if I could feel it sticking to my own skin as events exploded around me. This is an origin story, Cameron and Kalogridis pulling elements from four of Kishiro’s original stories in order to craft their adaptation. As such it resolutely feels unfinished, things only progressing to a certain point with a number of important questions and confrontations left to be answered and completed by the viewer utilizing their own vivid imaginations. It also means this is half a story, the climactic cliffhanger, while not as blatantly obnoxious as the ones at the end of epic adventures like Pirates of the Caribbean: Dead Man’s Chest, The Hobbit: The Desolation of Smaug or Avengers: Infinity War is still moderately annoying. What the filmmakers do here inadvertently makes their film feel like a prequel to a sequel we’ll sadly never see then it does a cagey way to force the audience to become even more a part of the story than they otherwise would have been, and as such I’m not at all certain a paying audience will walk out of the theatre satisfied. As for me, I’m far more okay with all of this than I normally have been in the past. I found relative newcomer Salazar to be outstanding as Alita and was simply blown away by both her performance as well as the motion capture effects that were required to help her bring this character to vibrant, exhilarating life. I was equally mesmerized by this world, found myself obsessing over multiple facets of it even if I could oftentimes feel all the science fiction influences that likely played a major part in inspiring not just Rodriguez’s and Cameron’s designs for the finished film but just as likely Kishiro’s source material as well. 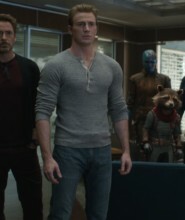 Even if I wished Johnson’s performance and character could have been better developed and not come across as if Hugo was some forgotten member of a 1990s boy band looking to radically reinvent himself, and even though the motivating factors fueling the villains as they attempt to hunt down the heroine are somewhat trite in their banal unoriginality, I still enjoyed this adventure quite a lot. 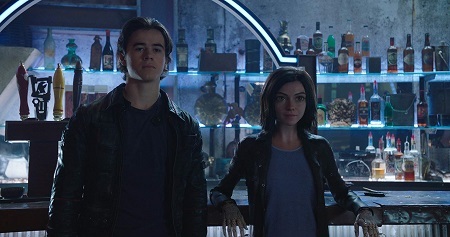 Alita: Battle Angel has its own sense of purpose and moves with a cagily confident self-awareness that’s wonderful. Even if this story doesn’t continue with future adventures I’m still satisfied by what Rodriguez, Cameron, Kalogridis and the remainder of the cast and crew have delivered, and I for one plan to see it again, in 3-D even (which I normally despise), as soon as possible.